Susan B. Anthony Day is observed annually on February 15 in the USA. This day commemorates the birth of Susan Brownell Anthony, an American social reformer who played a leading role in women's suffrage movement. 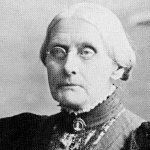 Susan Brownell Anthony was born on February 15, 1820 to a Quaker family. She started to collect anti-slavery petitions, when she was 17. At the age of 36 she became the New York State agent for the American Anti-Slavery Society. Women's suffrage bean in the 1840s, when it emerged from the movement for women's rights. The first two national suffrage organizations were established in 1869. One of the organizations was led by Susan B. Anthony and Elizabeth Cady Stanton. The leader of the other organization was Lucy Stone. In 1890, after yeas of rivalry two companies merged as National American Woman Suffrage Association and Anthony became its leader. Susan B. Anthony Day is not celebrated on national level. It's a state holiday only in some states of America: Wisconsin, Florida, West Virginia, California and New York. Representative Carolyn Maloney of New York introduced the act to honor birthday of Susan B. Anthony as a national holiday on the third Monday in February, but the bill was not enacted.